The Boston Red Sox struggled at home this week with a 1-5 homestand and are now 14 games behind the AL East leading Baltimore Orioles. However, the team did not improve in one category this week: offense. The team has been able to score runs the last three games post trade deadline and look like a team that will be happy to keep the lineup moving on a regular basis. The Red Sox will have to do a lot to reach .500 this season, but the ownership needs to take a look at all the parts moving forward to decide what needs to be done in the offseason. But at least they started with a blockbuster trade deadline. The Red Sox let loose last Thursday with four deals that saw the two veteran pitchers on the staff dealt as well as a strong reliever and a solid defender at short. The first move that was made was sending Jon Lester and Jonny Gomes in a package to the Oakland Athletics for Yoenis Cespedes. The Red Sox may have lost a 10-7 pitcher with an ERA of 2.56 who is a free agent in the offseason, but the team also got a young power hitter with 17 homers this season in Cespedes. The team was not done as John Lackey was traded to the St. Louis Cardinals for 1B/OF Allen Craig and starter Joe Kelly. Lackey was leading the staff with 11 wins before the deal. Craig has been struggling with a .237 average and just seven home runs and Kelly has been dealing with a hamstring injury most of the 2014 season. Both Andrew Miller and Stephen Drew were also dealt right before the deadline. Miller was sent to the Baltimore Orioles for a minor league pitcher who was the No. 3 prospect in the Orioles farm system. Drew was sent to the Yankees for infielder Kelly Johnson. It was the first deal with the Bronx Bombers for the Red Sox since 1997. With a couple more starters on the move, the Red Sox needed to fill a couple spots in the rotation. Anthony Ranaudo got the call on Friday and looked pretty solid. 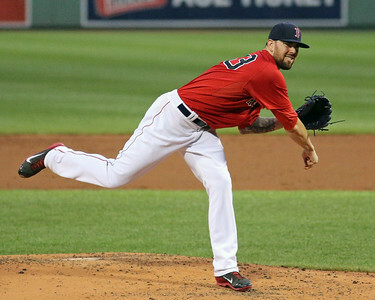 He got his first major league victory while allowing two runs over six innings in a 4-3 win for Boston at Fenway Park. Another pitcher who was affected was lefty Henry Owens who was bumped up to Triple-A. In his first start with the Paw Sox, the 22-year-old held the Columbus Clippers hitless for the first 5.1 innings before he allowed an infield hit. He went 6.2 innings with nine strikeouts, three walks and only two hits allowed. The Red Sox head out on the road this week for three at St. Louis and three at the Los Angeles Angels. This will be a tough stretch for the team as thewy will face Adam Wainwright on Thursday and a tough Angels offense over the weekend. Predictions: 2-4; the Red Sox have struggled offensively all season, but scoring over four runs a game since the trade deadline gives me some confidence that they can maybe outscore the Cardinals a couple times while also keeping up with the hot Angels for at least one game.